Firstly, I would like to wish all readers a very happy and prosperous New Year. “The Property Maverick” goal is to help you make this your best and most prosperous year yet. So let’s get started on your 2012 property journey. Timing is not everything, but time is as property is seldom a short term investment; unless that is you have the property knowledge. 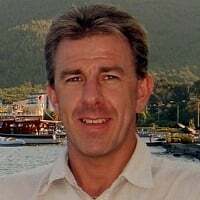 My task as “The Property Maverick” is to furnish you with all the property knowledge you need so you can make the right decisions at the right time. Remember, the difference between success and failure really is down to knowledge, or the lack of it. Property values, like interest rates, tend to moves in cycles, therefore, the key is to understand property cycles when building a portfolio that will stand the test of time. The bottom of the cycle is the depression. This is generally marked by low prices, greater numbers of homes for sale, few new home construction starts and lower rental values and rental demand. Eventually, the depression bottoms out, typically when you hear people saying that no one will ever make money in property again. This statement is borne from a lack of property knowledge. Just like the stock market, you can make money from property whether the market is going up or down. Then the recovery starts to materialise. Prices are no longer falling and rents and rental demand increases. But, there are still few new home construction starts which is basically where we are right now in the current property cycle and are likely to remain until at least 2013. Optimism takes over, and the boom sets in. New home construction speeds up and house prices rise rapidly. Finally the top of the market comes, typically when you hear everyone saying property is a sure thing. Suddenly, out of nowhere, the downturn arrives. New home construction reaches levels out of hand and some bad property schemes such as when no money down deals get hatched in the midst of the last frenzy. Returns and property prices start to fall. Then the cycle starts all over again. The same sequence just keeps playing itself out again and again. Interestingly, in the UK we saw this cycle played out in the 1970’s and 1980’s but then had to wait until 2000 to 2007 to see it again. Ultimately, property markets are what make you rich. Avoiding the bad markets is what keeps you rich. In summary, when everyone is selling you should be buying, and when everyone is buying you should be selling. Put simply Buy Low Sell High. Now here comes the curve ball. Where property prices have been is irrelevant, where they’re going is much more important. What you really need to consider is the affordability of property. Housing affordability is a major contributor to both the cost of living and the standard of living because housing represents the largest item in household budgets. 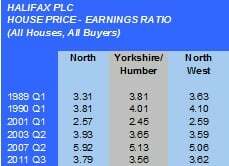 According to Halifax PLC right now in the highlighted areas the ratio of house prices versus earnings is virtually the same as it was in 2003 and in 1989. However, the true test of affordability is mortgage affordability. According to the Halifax PLC mortgage affordability is mortgage repayments expressed as a percentage of income. Right now in the highlighted areas the cost of a mortgage is almost 50% what it was at the market peak in 2007, and is roughly 40% of what it cost at the previous market peak in 1990. This is another indication that we are more or less at the bottom of the current property cycle. The availability of mortgage funds being the wild card in this assumption. Click Here to download the HALIFAX Property and Mortgage Affordability breakdown for the whole of the UK for the last 28 years. “The last time housing was this affordable (2001), property prices doubled in six years“. Note the same is not true for most southern counties or London where severe unaffordability means first time buyers are literally frozen out of the market due to the large deposit needed. The north/south property price divide is today back once again with vengeance. By county, the north lies above the old counties of Gloucestershire, Warwickshire, Leicestershire and Lincolnshire and nips only into parts of some of those counties. Most of each of those counties, and all the areas of England below them, are in the south. From the above you can see that since the credit crunch the north has fared much worse than the south. Prior to the credit crunch the percentage increase in the north was better than the south. This was mainly due to starting from a lower price base. The best comparison to this scenario is “Emerging Stock Markets”. They also fare much better in times of optimism and fare much worse in times of negativism. Property prices in the north, like “Emerging Stock Markets”, exhibit greater highs and lower lows. Therefore, investment timing is much more important for the North than the South. So why is this? The main reason is that the north is far less affluent and is more susceptible to optimism or a lack of it. Also, when things do go negative a far greater number of repossession properties come onto the market driving prices down severely in some areas. This scenario creates the window of opportunity to portfolio build at lower prices. A lower price means greater rental yields, and a greater potential for price appreciation. This is especially true today as the north offers a greater opportunity to buy properties well below market value that contain instant equity on day one of purchase! Please do enter your thoughts and views on Property Cycles and current Affordability? Ultimately, there are two factors that determine risk and reward in property investing, and that’s leverage and diversification. You really can lower your risk substantially by diversifying across many properties and sectors. This and more will be discussed and revealed in the next “Property Maverick” blog “How to build a balanced property portfolio with No Risk”. Until we speak again. “If you do things well, do them better; be daring, be first, be different, be just, be a Maverick”. A facinating look at the property cycle based on affordabilty. Based on simple economic principles of Supply and Demand you would normally predict a swift recovery. As the Maverick points out though the real wild card stems from the Banking system, National Debt and availability of finance. We have not had such a controlling influence in a very mature market for a long time. For the first time understanding politics could be more important than economics.